BIG CRUSH is a grand time to see the harvest in action and this year will be no exception. Saturday, October 5th and 6th, 2019 from 11 a.m. to 4 p.m. you’re invited to see the Crush in full swing. Your ticket includes scenes of teeming vineyards, trudging tractors, and bustling crush pads accompanied by incomparable Amador Wine Country hospitality! Creative food & wine pairings, a variety of live music, and harvest activities are presented by warm & friendly family wineries across the county. How does it work? Purchase a glass and wristband a participating winery on Saturday October 5 or Sunday October 6 and then spend the weekend exploring all that Amador Wine Country has to offer! 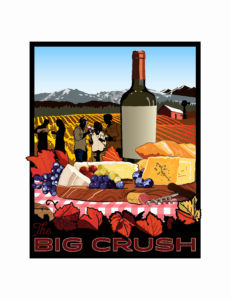 Each ticket includes wine offerings, food pairings, entertainment (at many locations), special offers at all 40+ Amador Vintners’ member locations and a commemorative Big Crush wine glass to take home.